I have mentioned before that my husband’s family hails from down south our little archipelago. From a lovely city called Zamboanga to be exact. I’ve been there twice before, the first time carrying with it the particularly happy memory of getting engaged. It is a place not often visited by the average local tourist, who you will most often find in one of the idyllic beaches in the Visayas region (the middle portion of our islands). But Zamboaga City holds many charms for those who venture onto her doorstep. Zamboanga City is sassy jewel cozily ensconced between sea and mountain, which in my book is the most enviable position for a city to be in. It has a pristine island off its coast whose shore is the palest pink. Remnants of Spanish rule cling sultrily at every corner. More than any place that I have visited in the Philippines, it is really Zamboanga that has the atmosphere of an old colonial stronghold. You can feel it in the air, taste it in the cuisine, and hear it in the language – a Spanish-Filipino patios called Chavacano. And it is home to curacha, a deep water crab particular to the region. Its bright red-orange shell (which remains the same whether live or cooked) and large, slightly hairy body may look a tad monstrous to some, but all I see is the moist, sweet meat within. This curacha was a much-appreciated gift from my father-in-law, flown in to us from Zamboanga. C picked up the cooler from the airport and rushed home where little C and I made quick work of its bindings. I couldn’t imagine how little C would react to these creatures but the hyper-exaggerated combination of excitement and terror made me kick myself for not taking out my video cam. When we are gifted with these prime specimens we usually have some simply steamed and work at them tirelessly with our hands until every last bit of meat is in our tummies. There were so much of them though, and a couple were just huge, so I decided to pick the meat off a few and freeze it for later use. This pasta dish was the result of some of that meat…a splendid result! Optional: greens for garnish – I used wild rocket but I think basil would work well too. – Cook the linguine as per package instructions (don’t forget to salt the pasta water!). Save some of the pasta water. – While the pasta is cooking, heat a couple of generous glugs of olive oil in a pan. – When the oil is hot add the onions and garlic and sauté until the onions are soft and translucent. – Add the tomatoes, tomato paste, and chili flakes, and stir. Let this cook for about 10-15 minutes, until some of the liquid has evaporated and the tomatoes are thick and pulpy. Add a couple of swirls of olive oil, salt and pepper to taste, and let this cook a couple minutes more. – Add the crab meat and stir. Cook this for another 5 minutes or so until the meat heats through and the flavors meld. Taste and adjust seasoning. If that sauce looks like it’s drying out add some pasta water. – Add the cream and stir. Cook for a minute or so and adjust seasoning on final time. – Toss with the cooked pasta noodles, adding the sauce a little at a time. You may have some sauce leftover. Alternately you can serve the noodles and sauce separately. Unlike most crabs, whose best meat is in its claws, the curacha’s meat is concentrated in its body. I still remember the first time I tried one and it seemed like every time I hungrily poked my fingers into its body more and more meat came out. The meat itself is sweet and soft and absolutely delicious. 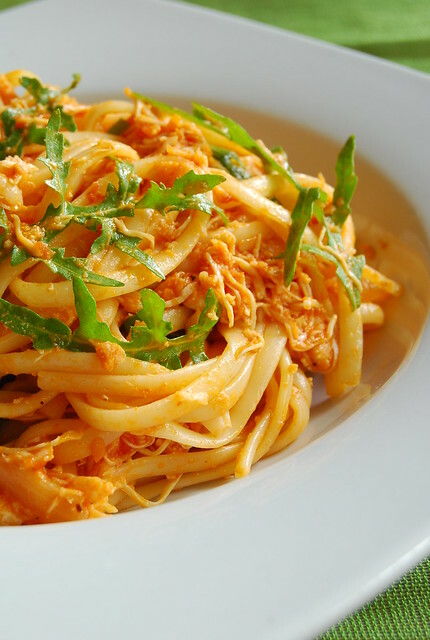 This is a simple crab pasta with chili, tomato, and cream…made just a little more special by using our beloved curacha. I threw in some wild rocket at the last minute to add a touch of green. Adjust the chili to suit your taste and feel free to experiment with the greens/herbs you use. I am thinking of making a version with fennel…what do you think? That pasta dish looks so scrumptious! Oooooo such a sunny dish. Really beautiful Joey! and I'm sure it was delightful. This looks absolutely wonderful. Definately on my to make list. Thanks for sharing. Oh my goodness…had curacha only once in my life and it was sooo delicious! Thankyou for sharing this recipe, it looks yummy! Crab and pasta is such a gorgeous combination – and given the sweetness of curacha, this must have been quite a meal. Just a suggestion from me about the leftover crabmeat: serve it cold on top of chilled buckwheat or green tea soba with a light drizzle of soy or ponzu sauce and some minced chives on top. Light and lovely! Hi Suzi! You are welcome…hope you like it! Hi Midge! Thanks for the idea…that's sounds delicious! I don't think my husband likes crab 🙁 hmm I know, do you recommend anything else? the fat (aligue) inside the carapace is perfect in the pasta sauce, too! i love the sweet, coconutty flavor of the curacha aligue. as to the loot in the freezer, an omelet chock-full of crab, perhaps, or a rich crab dip, o a crab salad with lots of celery and a light mayo-wasabi dressing, spread thickly on ciabatta. am so envious! This looks delicious! An extra past dish recipe is always a plus! Yes i love the fennel idea!! I now want to see that extra crab that you have in a re-vamped Crab rice dish ! YUM!! Jo Lets make some Crab Rangoon! I miss this ! Spray a 12-Muffin pan with cooking spray. Place 1 won ton wrapper in each cup, allowing the edges to fold over the sides of the cups. Fill evenly with the crab meat mixture. Bake for 18-20 minutes or until the edges are golden brown. Hi Mar!! 🙂 That baked crab Rangoon sounds fantastic! I want to make! Oooooh, curachaaaaah!!! I think the last time I had that was when Alavar was still open here — probably in the early '90s. How I miss it! You're so lucky that C is from Zamboanga and you can get this delicious crustacean flown to you! Delish Joey. I love crab. It is part of my childhood as my grandfather would take us on crabbing catch most weekends. Hi Katrina! We are counting our blessings! Now I’m craving Alavar sauce! Hi Tammy! Hope you like it!